Defying my orders, the student plumped down in the corner—conducting a sit-in. My first test had come. Shock engulfed me. Panic followed. So I phoned a friend. An assistant principal took the line. "You need to tell him he has two minutes to make a decision: get up and go back to his desk, or stay seated, and I will come down there to get him." A minute in, the student realized the cost. He reoccupied his desk. Handling defiance is one of the most challenging tasks we face as teachers. But with the right plan in place, we can control such acts with wisdom and diligence. 1. 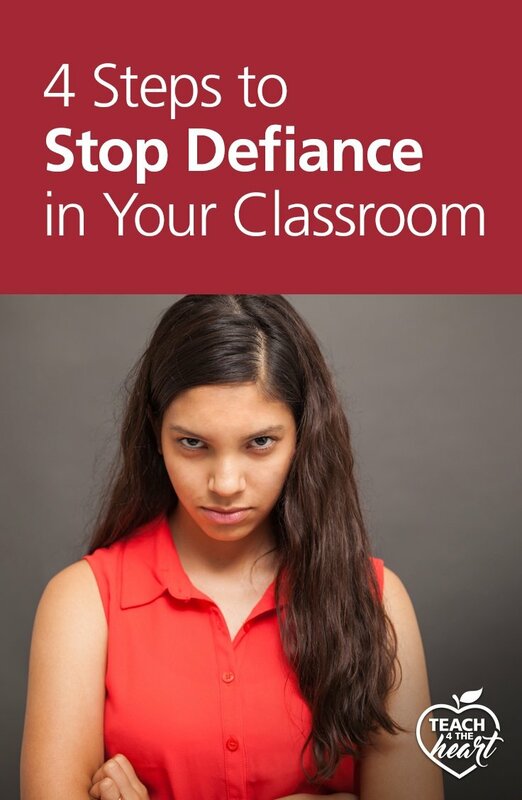 Remove a defiant student's audience. I learned in Classroom Management 101 that the essential first step is to remove the audience. If possible, send the student out into the hallway. The stakes rise when a student knows all eyes are on them. Without the attention, the student is less likely to continue their defiance. You can still do your best to remove the audience even when a student refuses to leave the classroom. If a student anchors himself in the corner, delay the situation for a short time. Encourage the rest of your class to continue working. Once they are focused, calmly approach the defiant student. Don't yell. You'll bring back the audience. Whisper in the student's ear, "You have one minute to do what I am asking you to do, or you can stay put, and I call for a principal to come get you." Presenting the order as a choice works well for some students. Give them a time limit to make their decision. Time, as you know, is precious, so make it reasonable. If they refuse to obey, make the call. Don't delay. 2. Have a plan and execute it. Chances are if you have a student who is willing to test you once, they'll try again—unless they know you're prepared and mean business. Once you've removed the audience, make sure the student knows that you will not tolerate defiance in your classroom. Then let them know your next move. I later talked one-on-one with the student who ignored my orders. I let him know his mom's cell phone would light up with my name on it after school. I also told him and his parents that the next time he blatantly disregarded my orders, he would receive a discipline referral. A few weeks later, he conducted another sit-in. He went home with a referral. 3. Contact parents and share your plan with them. 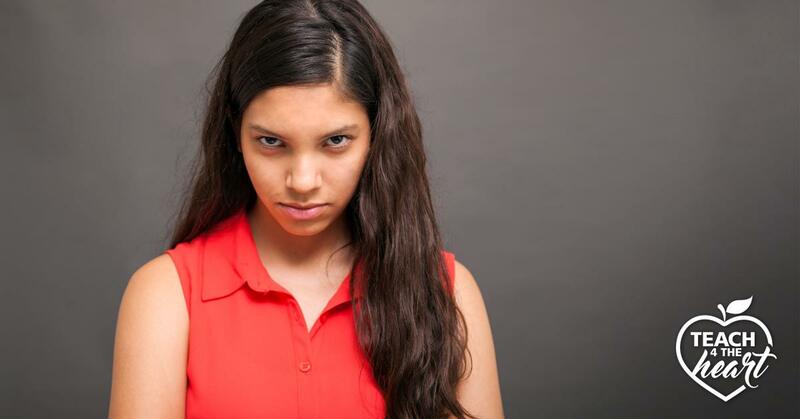 Communicating with parents is key when dealing with a defiant student. Take the time to notify parents of the situation. Reflect and take notes of the student’s behavior before you call or email a guardian. You’ll be able to relay what happened with precision. Most parents will want to join in and help deter future defiance from their child. They'll appreciate your effort to reach out and keep them informed. Plus, parents may have seen similar behavior from their child at home. They may give you some insight into what may be causing some of their student's noncompliance in class. And while nothing can excuse the child's behavior, any information you receive from a guardian may help you better assess and correct future defiance. 4. Communicate with students and let them know you care. Turns out, the student ignoring my orders had a ton on his mind. Recent events clouded his thoughts. After talking to his parents, I realized he needed me in his corner. His defiance was a call for help. Sure, some students disobey out of spite. But teachers must attempt to communicate with a noncompliant student no matter what. Ignoring a student who is ignoring you is a missed opportunity. Let your defiant student know you hear them. Give them your time. Remind them they have people at school who love and care for them. Ask if they would like to speak with someone beside you. Maybe they’ll open up to a counselor or a principal. You can later check in with those people. Always have the student’s best interest at heart, and show that you notice them. At recess, I spent time playing catch with the student who was acting out. We talked about his basketball team, his favorite cartoons, his favorite music—anything and everything that brought a smile to his face. His attitude brightened. He stood taller. Instead of turning his back on me when he didn’t get his way, he began doing what I asked. He knew I cared. So he cared. And he started minding my instructions. There are many ways to communicate with your defiant students. You can eat lunch with them, write them a hand-written letter, or talk to them at recess. Pay attention to them. Instead of plumping down in a corner, a student who feels your love and care might dive right into your lesson. Classroom Management 101 was so helpful for me in learning how to deal with defiant students - and so many other classroom issues. This online course will guide you step-by-step through the process of developing & implementing a strong classroom management plan. And not only that - it will give you the skills you need to start the school year RIGHT so you can avoid so many potential problems and teach effectively all year. Find out more about Classroom Management 101. I had a very challenging class this past year. I never felt fully in control and all students were affected. I became very discouraged and questioned if I was doing the right thing being a teacher. Now, I feel like I have very definite plans and strategies to turn to. Your procedures and organization ideas are great! I really like the idea that if you teach them these things at the beginning of the year then the whole year will be smoother. This is a great course with great ideas. and it is broken up into small segments so it is easy to fit into your day! more useful than any pre-service training I've had in years! I highly recommend your seminar to any teacher new or veteran. It's great practical real-life advice that teachers don't learn in college. There's no substitute for experience, and you've used your experience in the classroom to help and remind teachers of what's really important; student learning, building relationships, and saving your sanity. I'm going to share your seminar with my administrators. This was more useful than any pre-service training I've had in years! My classroom was completely transformed! The biggest concept I incorporated was whole brain teaching. My classroom was completely transformed! Within the 4 weeks of teaching my 4 new Whole Brain rules, I had students who showed more respect and who took responsibility over their actions. Not only did behaviors decrease, but the students were more engaged and productive! I also felt like I was able to teach more because I wasn't dealing with numerous problems per class. Amazing! Joining Classroom Management 101 helped to completely transform my classroom! Linda does an amazing job of encouraging you to have a servant-hearted mindset, and then she guides you through creating a practical classroom management plan. It was the best choice I made this school year! Before I took Classroom Management 101, I felt I was always struggling to maintain control. I have 3 students who drive my classroom to distraction, and reigning the students back in has been a struggle. The biggest thing I learned is to stay consistent, be positive, and have high expectations. Now, I am more consistent. My classroom is still a work in progress but it is much more manageable. I don't feel like I'm drowning anymore! I absolutely recommend this course to teachers of all levels of experience. Everyone can benefit from this course, and I have been touting its benefits during back to school teacher meetings. I feel refreshed and supported in my perspective to prepare the classroom so that spiritually, socially, physically and emotionally I can minister to the needs of students and promote growth. Linda has thought of most every situation that affects classroom management and addresses each thoroughly from a perspective of wisdom and honor. Classroom Management 101 would be the best investment you ever made in your career. I learned more from Teach 4 the Heart than I did in all 4 years of college. Before I took Classroom Management 101 my classroom management was ok, but even after 13 years of teaching I never felt that I had been 'secure' in what to do or say and most of the time it was just muddling through! Now I'm much more organized and learned to actually spend time on procedures. On teaching practice you just adopt someone else's class so you never see that part, then you wonder why it all falls apart when you have your own class! I definitely recommend this course for first-year teachers and more. It's so structured with useful points being repeated throughout so it's easy to pick up and work with! Thank you for all the amazing ideas you have provided. Your class has given me so many ideas and takeaways that I’m going to be implementing next school year. I feel more confident with more ideas and a better plan. Thank you! What about when the student enjoys going to the principal’s office and his parents don’t care about his behavior in class? I had a student who regularly defied my directions, refused to do his work, and frequently refused to participate. I usually would ignore his behavior until I could deal with it, but he became a danger to himself or others. This was my year as well……. I have about 8 in one of my rooms that don’t care- and frequently derail the class and refuse to leave. I have to ignore them just to get through the day. It is always a good idea to give students a choice. But: how do you cope with a student if you cannot ask the principal to come and get him? Just leave him in class? Haha! If only it could be that easy! The principal and the assistant principal could care less if a student is defiant and they sure don’t want you calling the office for a defiant student. Second if you can get a parent to answer your phone call they mostly say that’s your problem now and you take care of them when you are with them and don’t bother me at home. So you have no support from administration or from parents! Then what? You try to get on their side by getting to know them and they try to take advantage of you later with I thought you cared so that means I can do what I want. Sorry but this is not helpful! We realize things are never simple. But you also cannot allow yourself to be disillusioned. Often results don’t show up for months or years. (I had a defiant student that I didn’t see results with for over a year and a half – but then they became one of my best students). Keep doing your best. Keep trying to reach students. Don’t give up. What do you do when the admin nor parents are of help with a defiant? Find a new school or work through it with your suggestions above eg. playing catch with them etc? That’s a tough situation. Definitely do the best that you can, but I can’t tell you whether to switch schools or not. I’d encourage you to pray about it. Sometimes we are called to stay, sometimes we are called to go elsewhere. In my experience, it’s an unspoken expectation that the teacher handle these situations. Administration, nor parents step up to the plate more than once or twice..